Chef Daniel Boulud, who hosts the East Coast's only offical Oscar party, shares his best tips for organizing viewing parties at home. On Sunday night, Daniel Boulud will host the East Coast's only official Oscar party at Daniel in New York: The Academy’s Oscar Night Viewing Party & Dinner. We've teamed up with Twitter to cover the cinematic gluttony live so you can follow along @foodandwine starting at 6:30 p.m. EST. Famously gregarious, Boulud is often the life of food parties, but he also knows how to create a killer spread at home. Here, the chef shares his best tips for organizing viewing parties at home. In France, getting together with friends is centered on food, and there is always charcuterie to start. 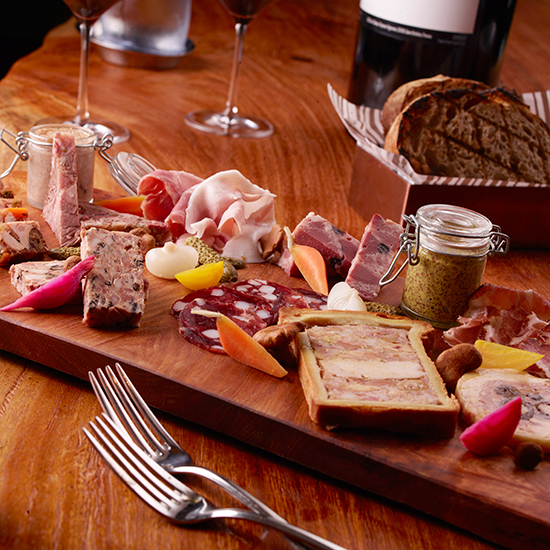 After living in New York for a while, I found that there were not many options for good, French-style charcuterie—so when I opened Bar Boulud in 2008, I wanted it to be a focus. I enlisted Parisian charcutier Gilles Vérot to lend classic recipes. But don’t worry, when creating your own charcuterie board at home you can simply enlist a local specialty food store—the key is a variety of styles and accompaniments. I suggest a nice pâté—like pâté de grand-mère (chicken liver, pork, Cognac) or pâté grand-père (foie gras, pork, port)—a dried cured sausage like saucisson sec (pork, red wine and black pepper) and a cooked ham like Jambon de Paris. A loaf of fresh sourdough bread, cornichons and spicy whole-grain mustard are the finishing touches that will make the board look super soigné. In recent years, there has been an explosion of interest in all sorts of different cheeses. As a Frenchman, I always have some nice cheeses on hand to offer my guests. A variety of six to eight for a small gathering, and since I am a bit of a cheese purist, I serve them with no or minimal garnish. My favorite is nutty, creamy Comté, followed by bright, salty Mimolette; I also suggest having a fresh chèvre, earthy brie and a blue. If you want to dress up the board, though, you can garnish with some mâche. For a bit of color, dried fruits, nuts or honeycomb. Aioli is something I do all the time at home for friends—no matter the season, you can gather some nice vegetables from the market—like fingerling and purple potatoes, radishes, baby carrots, asparagus—and raw seafood like lobster and shrimp. Arrange it all on a tiered stand, and you have a beautiful platter. Now, be sure to take care with the dressing. Aioli is all about the dressing—I suggest half raw and half cooked garlic; if you are adventurous, go with all raw garlic! The aioli is very Mediterranean, so be sure to complement it with a few nice bottles of rosé. I chose Pissaladière for an Oscars party because it is very easy to put together before guests arrive and looks great when it comes out of the oven. You can also make it in advance and serve at room temperature—traditionally in Nice, it was cooked in the early morning and then sold at the markets. You can use pizza dough for the crust, roll it out very thin and then top with caramelized onions, black olives and anchovies. These will be the award winner of the night—soft, warm, lemon-scented and dusted with powdered sugar. You will need a madeleine pan to make the mini cakes, which can be easily found at Williams-Sonoma or at any other home store. The batter can be prepped the day before and stored in a pastry bag. Just before the night’s final set of awards, pipe the batter into the molds and pop into the oven for about five minutes (for mini madeleines). As Best Picture is announced, they will be ready for enjoying.